PCSchool has added student based emailing through the ‘Spider’ Web App. This enables teachers to email all students in a class, or an individual student and their related identities (Caregiver, Form Teacher, Subject Teachers etc) from various controls within the Spider. This will then open the Student Based Email view where we have the ability to get all the entities related to a student (if we run from student based launch) or the entities based on the students in a class (based on class launch). If there is no email in the IDENTITY for the entity, its shown in red and doesn’t get added to the recipients list on the right hand side. 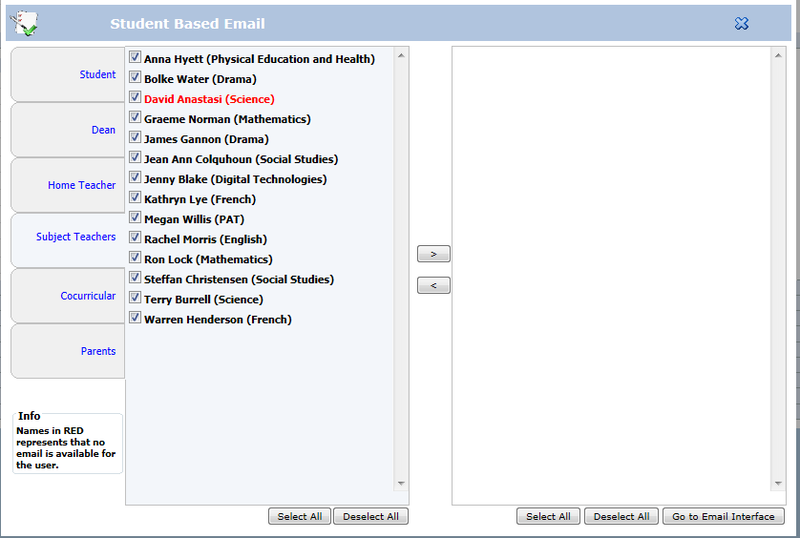 Once all the recipients have been added go to the Email Interface where you can create and send your email. Version 1 of this control will allow emails to be send as BCC list only. If you have SSL enabled, then we show a box on the left side for entering the authentication username and password. This will be used for the from email by most mail servers (if its SSL enabled in configuration). Otherwise it will be sending email based on From Email (which is the email in the IDENTITY) of the user. This control can be launched from Student Information (based on student), the student in My Classes (based on student OR on the class). The ability to email from other controls will be added over time. The settings for email are in appSettingsLocal.config, which you can find in the spider folder (on the IIS server). Once this is configured properly, restart IIS by either going to IIS manager or going into web.config (on spider folder) and putting a space in it and taking it back (when ever there is a change in date modified in this file, IIS for this website gets restarted).